Yogi Berra has been one of my heroes since I was a little boy growing up in the 1950s. To this day, he remains one of my heroes, and I even have a small plastic statue of Yogi on my credenza in my study in my home. Yogi was first and foremost an incredible baseball player. He played in more World Series than any player in baseball history, appearing in 21 of them and winning 13. He was an all-star for 15 seasons and the Most Valuable Player of the American League three times. He managed both the Yankees and the Mets to pennant-winning seasons and World Series appearances. But he was more than a great baseball player. He was a philosopher and a cultural icon. It is an understatement to say that he had a way with words. The man who coined the phrase “de je vu all over again” and “It ain’t over ‘til it’s over”, was something of a poet. Like great poetry, his famous quotes often appeared oxymoronic, but when you thought about them, they made perfectly good sense. The lousy teams are good this year. Yogi is in Heaven now where if they have a baseball team (which I’m sure they do, since it’s Heaven, after all), they now have one Heaven of a catcher! I wish I could go to Yogi’s funeral, but it will probably be so crowded nobody will attend it. Good-bye, Yogi. Thanks for being my all-time favorite baseball player. You were the only Yankee this Cardinal fan ever loved. Falcon Vector Art: Use your time to make something for someone else. A lap quilt for someone in a wheelchair, a small quilt for that cantankerous child, a prayer shawl (knit or quilted) for someone going thru a tough time. Buy Online In Pakistan: Yogi Berra has been one of my heroes since I was a little boy growing up in the 1950s. To this day, he remains one of my heroes, and I even have a small plastic statue of Yogi on my credenza in my study in my home. Write My Assignment Cheap: Very informative article but Please tell me who invented baseball game? Buy Custom Papers Online: There is a mistake in this article. I contacted the Baseball Hall of Fame yesterday to let them know the article on their website. They have already made the correction, and a professional baseball player, and one of Yogi's close childhood friends. Thanks. term papers for sale: These yogi and pundits are only available in Indian estate. With their dramatic facts; they like to play with people emotions and with their brains. Their false understanding of people physic allows them to do fraud with people and use them as your way of earning money. 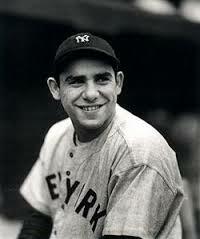 Randy Sellers: Stat of the Day: Yogi Berra caught both ends of a double header 117 times!